Underbelly has reflective astro-foil insulation + R-7 fiberglass under each holding tank. Also included is a 12-volt tank hearted for each of the holding tanks. The floor has a reflective astro-foil insulation + R-7 fiberglass insulation. The ceiling, front wall and rear wall have a reflective astro-foil insulation + two layers of R-7 fiberglass insulation. The side walls, three sides of the slide-out, the raised upper deck of all fifth wheels and all raised bunk beds are vacuum-bonded, aluminum construction with R-10 high-density block foam insulation. The slide-out floor also has a layer of reflective astro-foil insulation on top of 1.25” plywood decking. On all fifth wheels, the outside storage compartments have an actual heat duct blowing hot air from the furnace directly into the storage compartment. Every Wildcat Maxx comes with a vented attic to allow moisture to escape in the winter and heat to escape in the summer. 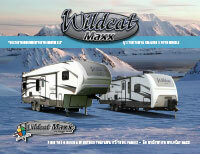 Every Wildcat Maxx comes standard with a 35,000 BTU furnace (30,000 BTU on Maxx Lite). It is important to remember that astro-foil insulation has a calculated “R” value of 38 at an ambient temperature of 80 degrees Fahrenheit.